XL is more than just a B-School. It's not a place or a location. It is - as one of its Founders once said - an experience that changes one's life - forever! It is ultimately... a "State of Being"! This blog aims to capture - through text and pics - those moments which go on to make an XLer! A few months ago, I was hit by a crazy idea. “XLRI should have a Writers’ Club. I should create one.” But like all of my other great ideas (“I ought to take over and rule the world”, for example), the idea simmered in my head for a while, not knowing how to manifest itself into action. And that’s how Writers Inkorporated (WINK) came to be—a name derived from an idea another close friend (who is definitely a Looney Toon, if ever there was one!) once had for his website. The first step was to get some credible people involved, because well…you know…we’re both cartoons. We needed people to take us seriously. So we went and spoke to a couple of professors. They were really supportive. The first one said he’s been waiting for students to start such “hobby clubs” in XLRI for a long time. Both the profs promised to support us with publicity and contributions and for judging contests and the like. With their blessings, we sent a spreadsheet to gauge interest in the batch. Out of 120 students, more than 50 applied. We called a meeting to give a short presentation. A grand total of 20 (:P) students attended that one, but more people contributed later through email. So we decided to just limit ourselves to mails. After some time, we had an idea—let’s get people to send us their creative writing and compile it in an e-zine and send it to everyone. And then, we indulged in some wishful thinking (“Dude, if it’s really good, we can get it published! We have quite a few XLers as published authors…they can definitely help us out!”). And thus, the seeds for the WINK Anthology were sowed. It took about a month to get contributions. We didn’t really shortlist the best, choosing instead to publish everything we got. But we did decide not to publish more than 2 entries per author. And then started the horror known simply as Term IV and Term V. What we had expected to be considerably “light” terms were anything but. And even in these terms, a couple more entries trickled in and some older entries got updated and replaced. Finally, Term VI came around. I wiped my white board clean, made a new to-do list, and wrote “WINK” all over it, leaving no space for anything else on the whole board. And then, we completed it, formatted and all, by December 15. You can get yourself a copy from Scribd, or just download it from my site.. Gratitude and Congratulations to Varun (Mangoman), Prof Madhukar Shukla and Prof Uday Damodaran. And also, of course, to every single person who contributed with his/her writing or in any other way to support WINK. Cheers. Here’s to a successful Vol 2! The word homecoming world-over signifies a tradition of welcoming back the alumni to their Alma matter to celebrate the spirit of conviviality and to connect with batch-mates, juniors, seniors as well as on-campus students. At XLRI the event - typically a two day affair organised by the alumni body of XLRI in association with the Jamshedpur chapter of the country wide alumni committee - is a concoction of sports and games, speeches, musical performances, and formal dinners. XLRI homecoming holds special significance owing partly to the long tradition of hosting batches after batches, on campus, since 1960 and partly to the overwhelming participation from world over. The prominent attendees from last year itself include Mr. B. Muthuraman, MD, Tata Steel, Mr. Kalyan Ganguly, MD, United Breweries Ltd., Mr. Bushen Raina, Chairman, JUSCO and Mr. Rana Sinha, MD, Telcon all from the Business Management program. Scheduled this year between the 20th and 21st of November, the homecoming is expected to play host to close to two hundred alumni. The event will kick off with an inauguration ceremony involving a presentation by Fr E. Abraham Director, XLRI and an address by the National President of alumni association Mr. Bushen Raina welcoming the Alumni back on campus. The two days that follow are packed with activities to keep the alumni engaged. These include the prestigious JRD Oath taking, the alumni award ceremony, formal dinners and community lunches. In addition to these more traditional events there are several activities aimed at increasing the level of interaction and association the alumni will want to feel on coming back to campus. The Nukkad-Natak – a street play performed by a contingent from the seniors and juniors batches - reflecting the XLRI value system and an evening of rock and country folk music by the Shiva band – being brought in especially from Kolkata - is sure to touch a chord and make the event an unforgettable one. Contributed by Chhavi Bindal, BM 2010-12. There are just some of those occasions when no matter where you are you miss your family. Diwali, the beautiful festival of lights and hope, is definitely one of these. The very thought of being away from home on this day would bring feelings of despair. But ask an XLer and you will surely be hit with a different viewpoint. The B school rigor doesn’t permit you to be home for Diwali but the beautiful XL culture ensures you make it a grand day in your calendar. So let’s begin with how it all started. The day started with people waking up early in their hostels (and this does include boys hostel :P) and gearing up for the celebrations. People put in hours to make their own little efforts which included internal room decorations, beautiful rangoli designs, lightning. The hostels transcended from mere buildings, they shimmered and glittered in the spirit of the festival. As the sun dawned the actual efforts being made since morning started taking shape. Lighting illuminated the entire campus - trees, bushes , buildings. There were diyas and candles on every road, every path. The regional association in charge of the arrangements (COWBAXI) did a fabulous job, the members ran the entire day to make sure everything was in place. 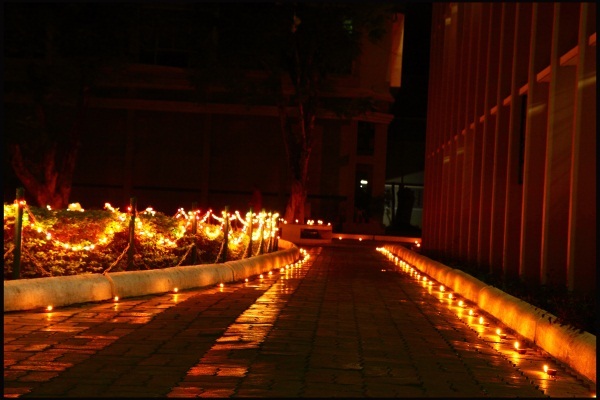 Evening saw everyone volunteering and lighting innumerable candles and diyas across the entire campus :). Then the celebrations began; everyone gathered for the traditional puja and recited the prayers. After the puja ceremony we all moved to the lawns where special arrangements were made by the faculty members. On our way to the lawn we could see the splendid amount of effort put in to ensure every nook and corner of the campus was brightly lit up. We met our excellent faculty at the lawns and were overwhelmed by their hospitality. There were stalls for everything right from snacks to main course to desserts and everything was a pure delicacy. It was a blend of cultures in the most delicious manner; there were idlis, dhoklas, cholle puri, jalebi, rabri and other mouth watering items. There was a crackers bursting session which saw participation from several students and faculty members. The entire XL family was in one place filling the ambience with extreme warmth and togetherness. This was followed by a small cultural night put together by the students in our favourite JLT arena. The setting was exquisitely traditional – khatiya, badam milk and an excellent show. There were numerous games and stunning performances by the students. There was a stupendous display of fireworks; the sky was brightly lit in red, blue, green, golden and other wonderful shades. The day made us fall in love with XL all over again, with the spirit of XL culture, the invaluable bonding and togetherness. It was an experience that goes into the diary of each one of us amongst the most cherished times and like all such experiences you just have to be there to feel it. The preparations for S.I.P had started long back with seniors helping us out by giving us gyan on Company, GD, Interview and subjects that could be asked in interview. This was a huge contributor to our success in S.I.P. Our professors also guided us till the last moment. On the day before the process started, XLRI campus was buzzing with excitement and lot of nervous people were wandering here and there in expectation of the Slot 0 companies’ shortlists. A huge roar went up as one after one the shortlists were put on the notice board of TFEMR hostel and a series of phone calls, hugs and congratulations started. But we were put-off to bed by our seniors as the D-Day arrived and the process had to start early morning. Seniors made sure that we were awake and ready for the process on time. For the first time in my stay at XLRI, XL hostels were full with life so early. People helping each other to get ready, newspaper sites being opened to have a quick glance at current affairs, notes being picked up for just in case preparation. For the next 3 days the same process was carried on and we had to go for GD, team tasks and Interview processes. One thing that was outstanding was the support we got from our seniors. They made sure that we ate at right time and every company detail was made available to the interviewees in advance. They were with us till the time we entered the interview room. “XL culture”rocks. At the end of the third day, the time came when the results of Slot 0 and Slot 1 companies were declared. With every announcement a loud cheer erupted and when all the results were declared we realized we have been the part of something amazing. In most places people would have started celebrating but we as a batch decided to celebrate only when all would be placed and that moment was not far as in next 36 hours all XLers had once again achieved XLence. That moment when the announcement happened that "Batch of 2010-12" is placed, a huge roar went up and both batches were hugging each other. After that the official announcement of offers were made by Placecomm and the roar was deafening. Then celebrations commenced on the hallowed JLT grounds. Well won't say anything else coz this is XL culture and I don’t want to spoil the surprise for those who would be a part of this soon. You have to be in the moment to feel the experience. Hope we would also be able to continue the tradition. There are 3 words that are guaranteed to wreak havoc in the hearts and minds of every first-year student at XLRI – Summer Internship Process. From before the second term begins, the preparations begin. It takes a certain amount of mental fortitude to go through the gruelling 5-day (and in the past couple of years, more than 5 days) process, being woken up as early as 4 am on some days, and having to stay awake until 3 am on some nights. There’s a lot at stake not only for the juniors, but also for the seniors. We talk about “XL Culture”, and in my opinion, this manifests itself best in the form of the support seniors give to the juniors before and during the process, and the obvious pride and joy we feel when the process is done. It’s in every XLer’s DNA to be as supportive as possible to those being placed. Every year, the seniors are worried about how their juniors will handle the pressure and the stress, and every year, the junior batch outshines its senior batch, proving they’re strong, proving they have the mettle and more. All the hard work you put into the SIP, whether as a member of any of the placement support teams, or just as a senior helping out a junior, it all feels sweet and satisfying when you see 240 smiles. No matter what, XLers stick together. It was great to see the juniors helping each other out with preparations, forcing each other to eat properly (! ), celebrating each other’s successes and just generally being perfect batchmates. People surprise you. When the going gets tough, the tough get going. That phrase is particularly apt for the batch of 2010-12. Congratulations on a truly awesome SIP! Now’s the time to celebrate, because come April, it’ll be the time to put your heads down, work hard and grab as many PPOs/PPIs as you can. Before I end this post, I’d like to link to a post written by one of my seniors during our SIP. It makes for great reading.